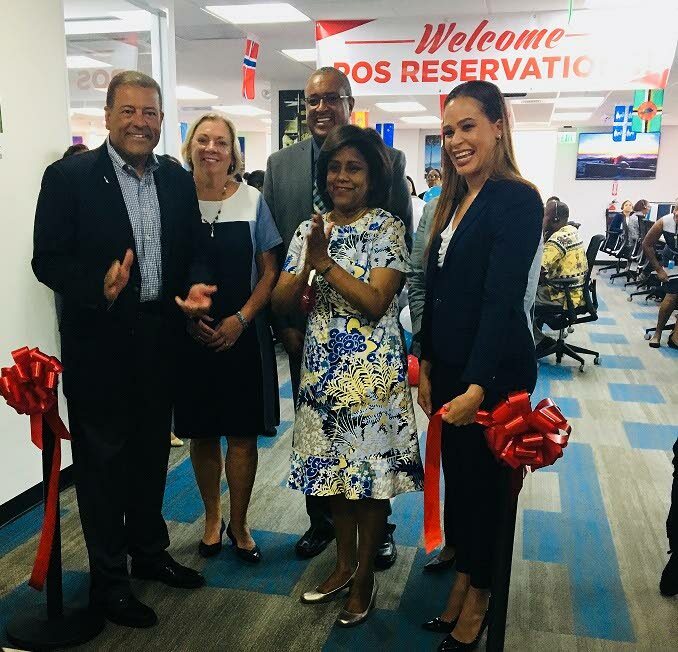 TT's newest business process outsourcing (BPO) office: American Airlines (AA) has opened a new, larger, reservation centre in Maraval. (Left to right) Alfredo Gonzalez, AA's MD for the Caribbean Region; Donna Kostelic, AA's MD of Customer Experience Eastern and International Reservations; Wellesley Joseph, AA's country director; Paula Gopee-Scoon, Trade and Industry Minister; and Rhea Dickie, AA's Reservations Manager at the ribbon cutting ceremony on July 17, 2018. PHOTO COURTESY THE TRADE AND INDUSTRY MINISTRY. TT's newest business process outsourcing (BPO) office has provided jobs for more than 100 people. Trade and Industry Minister Paula Gopee-Scoon said the decision by American Airlines (AA) to expand its BPO presence locally "further expands and adds value to the country’s BPO agenda. "The 100-plus employees hired by AA builds on the 600 jobs already created by iQor, the 750 opportunities generated by Scotiabank’s recently established back office support and BHP Billiton’s local operations." The minister was speaking at the formal opening of AA's new, larger, BPO in Maraval on Tuesday. The new offices service the Caribbean, the Pacific, the Americas and Europe. Reply to "American Airlines hires 100"